FOXBOROUGH, Mass. (AP) -- Darrelle Revis haunted and taunted Tom Brady and New England's offense at least twice a year for the past six seasons before the New York Jets traded him to Tampa Bay in April. FOXBOROUGH, Mass. (AP) — Darrelle Revis haunted and taunted Tom Brady and New England’s offense at least twice a year for the past six seasons before the New York Jets traded him to Tampa Bay in April. Brady and the Patriots finally were free. Then the 2013 schedule was released, revealing a Week 3 matchup against who else? “To go out of our division into the NFC, and of course we get him in Week 3. It’s a little bit ironic,” Brady said. “He doesn’t have any weaknesses. I don’t think I’ve completed many balls on his side of the field very often. All of a sudden, Tampa Bay has a couple of those playmakers who could cause problems for Brady and New England’s struggling offense on Sunday. The Buccaneers (0-2) brass emptied their wallets this offseason, overhauling a passing defense that ranked last in the league and quickly turned it into one of the most feared. They plucked Dashon Goldson away from San Francisco, signing the Pro Bowl safety to a five-year, $41.25 million contract in March. The Buccaneers then acquired Revis in a deal with the Jets and inked him to a six-year, $96 million deal. The Patriots (2-0) are well aware of Tampa Bay’s offseason acquisitions, though. They caught a firsthand glimpse during training camp when the two teams practiced for three days together. Revis, who had 19 interceptions with the Jets, missed most of last season after suffering a torn anterior cruciate ligament in his left knee during Week 3. He participated lightly during the joint practices, but never took the field for team drills. He now appears to be healthy again, which is bad news for New England. And more could be on the way. 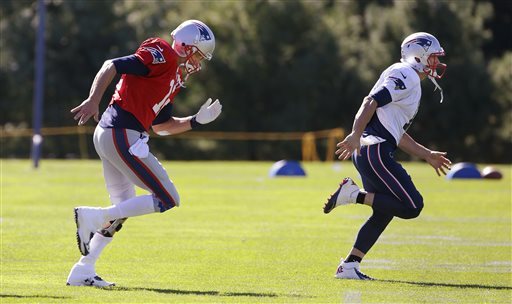 Tight end Rob Gronkowski and receiver Danny Amendola both were limited in practice this week. Gronkowski was listed as questionable on New England’s practice report Friday, while Amendola was doubtful, possibly leaving the Patriots’ shaky offense in jeopardy of struggling again against a much-improved secondary. Revis and Goldson anchor the revived unit that ranks 17th in the league after slowing Drew Brees and New Orleans’ high-powered offense last week. So did Goldson, who recorded nine tackles, one of which earned him a one-game suspension for helmet-to-helmet contact. Following an appeal, though, Goldson’s suspension — which would have left him sidelined against the Patriots — was reduced to a $100,000 fine. Brady doesn’t believe Goldson is a dirty player. Rather, the two-time league MVP said he admires him on the field. While Tampa Bay’s secondary has slowed opposing receivers, tight ends have posed problems. Kellen Winslow caught seven passes for 79 yards in the Jets’ season-opening win, and Jimmy Graham hauled in 10 receptions for 179 yards in the Saints’ victory last week. But Patriots tight end Zach Sudfeld isn’t reading too much into their success.